I found the above image on a social media page named "Philosophy Matters". Now, from what I understand, Nietzsche did indeed call me ugly. But more to the point, he did not agree with my methodology. This disagreement, he expressed, in a fashion that differs from my own point-to-point logic. Perhaps referral to my appearance was metaphorical, or rhetorical -- a way to underpin his thoughts about my philosophy. Or perhaps it is what people call an ad-hominem attack. 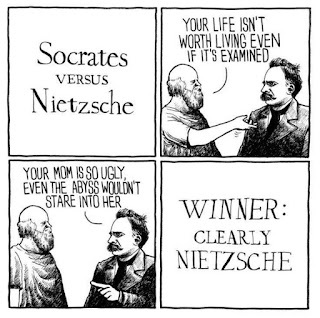 Would I tell Nietzsche his life is not worth living, even if examined? By the gods, I do not know. It is unlikely he would allow me to examine his life in my usual way -- the purpose of which is to help one focus less on bodily desires and more on reason in order to tend to one's soul and do what's right, which is the road to happiness. Nietzsche disagreed with this, so it is possible that I may conclude that his life is not worth living. Back to the image. I wonder why this was posted on "Philosophy Matters" with no accompanying text. It does not look like love of wisdom to me. If philosophy does indeed matter, should we not represent it accurately? Then again, perhaps it is just a joke. The Argument from Evil - What would God do?